We all love Trader Joe’s, the quirky supermarket carrying everything from produce to snacks to toilet paper at a low cost (with super friendly service). And while they carry a ton of fun ethnic foods like frozen Indian channa masala, Indonesian sambal chili spread and even Moroccan preserved lemon, they also have a pretty decent selection of Jewish foods! 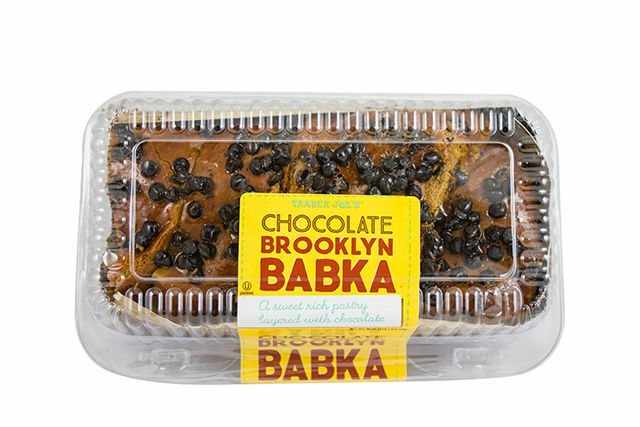 Brooklyn Babka: This sweet gooey chocolate babka rivals some of the best (and far more expensive) babkas heralded throughout New York City. Bonus: it’s non-dairy! Latkes: One of TJ’s frozen seasonal items. Look out for this around Hanukkah for last minute latkes, no frying necessary. Challah: If you are always struggling to find a good loaf, look no further than TJ’s bread aisle. They carry full loaves of challah and knotted rolls. They also carry round holiday challah for Rosh Hashanah! Cheese Blintzes: Find this brunch favorite in the frozen section! Hummus: Trader Joe’s carries many flavors of hummus included garlic, roasted red pepper and even edamame hummus. But our favorite is the horseradish hummus of course! Horseradish: Speaking of horseradish, TJ’s has got your gefilte fish covered with this staple, found in the refrigerator section. Tahini: For all your falafel or baking needs, you can find tahini in the refrigerated section along with a wide selection of spreads and dips. Muhammarra: Another great Middle Eastern dip, if you don’t feel like making your own, TJ’s has got you covered. Matzo: Of course, you won’t find matzo year-round, but look for it as Passover nears. Bagels: They might not quite be the New York bagels we all crave, but they will do in a pinch and come in variety of flavors including everything, pretzel and even seasonal favorites like pumpkin. Dill pickles: They carry everything from cornichon to bread and butter pickles, but you know it’s the kosher style dill pickles you really want. Rye bread: When the pastrami sandwich beckons, only a loaf of rye bread will do. And thank goodness Trader Joe’s has this too! Falafel: You can find falafel both frozen or in the pre-made lunch section for when that craving hits. Rugelach: Craving a sweet New York-style treat? Trader Joe’s carried chocolate and cinnamon nut flavors which are flaky and buttery, just the way you want them. Smoked salmon caper dip: It’s all the flavors you would want with your bagel, in the form of a dip. Find this is in the refrigerated section near the hummus and tahini.